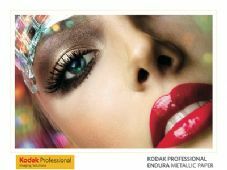 Kodak ENDURA PREMIER METALLIC Paper offers a high gloss surface and a "metallic" look and feel. Unique among RA silver halide papers on the market today, Kodak Premier Metallic is ideal for contemporary portraiture and commerical applications, but we have also seen it used to great effect in the sphere of fine art for less obvious subject matter such as landscapes. Images have incredible depth and appearance. Processing is in standard RA4 chemistry. Can be exposed Digitally (eg. Chromira, Lightjet, Durst Lambda, Fuji Frontier etc etc.) or traditionally under the enlarger. There have been many attempts to copy Kodak Metallic over the years, both by other manufacturers of silver halide papers, and also in inkjet media - none of these come close to the original, especially the inkjet attempts which are hopeless! This is the current available range of Kodak Metallic for the European Market. It is now all made in the USA following the closure of the Harrow plant in the UK.